Here is the first design of mine to be rejected by Threadless! 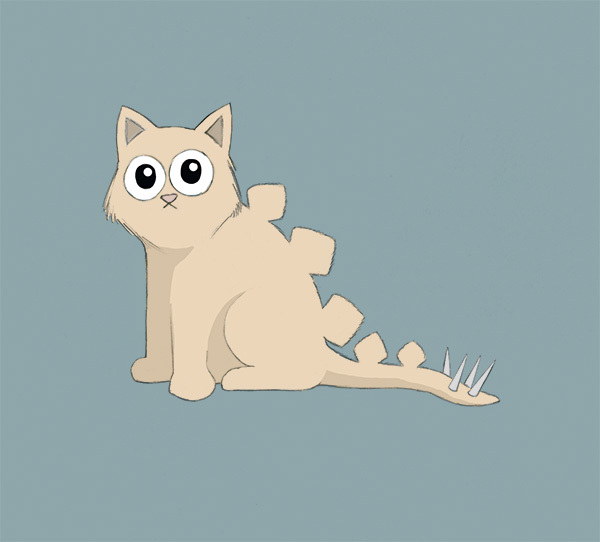 Too bad for them, this kitten has it all, and by “all” I mean “stegosaurus spikes.” So what went horribly wrong? Perhaps the design simply does not scream T-shirt. Maybe it is just a bit too simplistic and a circular enclosure with stars on it or something would make it look more like clothes. Or maybe some clever text should be incorporated. Perhaps Threadless is playing a game of heady psychological warfare that ends with me drawing the same stego-kitten over and over a thousand different ways before I realize “Wait. This is a pretty dumb thing to go all code red over isn’t it?” But by then it will be too late. I wil have wasted years of my life. My trembling hands will drop my last pencil on the floor, in a room littered with thousands of versions of the same drawing, each only slightly different. My old hoarse voice rattles a final “Whyyyyyy? and I collapse dead, face-first, on my own sketchpad. SCORE: A falconer’s glove (for petting unsafe kittens). This entry was posted in Originals and tagged dinosaur, Kitten, Stego-kitten, stegosaurus. Bookmark the permalink. I need to get this on a t-shirt… seriously!!! Please put this on cafepress. If you like, I can send you a message if that happens for reals. Thank you for the comment!